Karen and Sue ride their Harleys with the Iron Maidens, a motorcycle club they started in Manchester, CT, for the purpose of women riding together and supporting the fight to find a cure for MS by holding fundraising events. 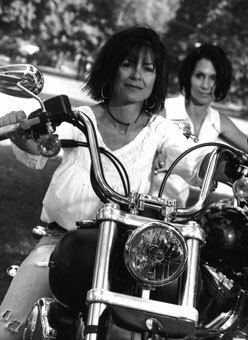 The two women describe themselves as soul sisters who met in 2003, and shortly thereafter took a class to learn how to ride motorcycles. Almost every weekend during the summer they meet with other women to feel the wind on their face, and enjoy their outdoor runs. Last year they raised $8500 for MS, and hope to raise $10,000 in 2009.